The weekends of #CutTheCheck games are over, (well not for NC Central and Bethune Cookman ) for most of the MEAC. The Week Four slate features three MEAC games, one cut that check game, and two MEAC teams clashing in a game that doesn’t count within their conference record (I’ll explain). Here are my MEAC picks of the week! The Circle City Classic has a very important historical significance within the history of HBCU football. The game featuring HBCUs in a neutral site contest played in Indianapolis, Indiana on a yearly basis. As the game tries to find new life, two prominent programs will walk into Indy looking for their first conference win of the season. The Circle City Classic was once 2nd only to @BayouClassic74 in terms of economic impact and #HBCU recruiting along with the best of HBCU football. Last season, Howard snuck past BCU in the final minutes of the game to escape with a two-point win. This season, the result might be close again. Caylin Newton from Howard and Akevious Willaims from BCU will be looking to light up Lucas Oil Stadium on Saturday. Although only playing two games so far, Newton is 4th in the MEAC in rushing touchdowns and 2nd in the MEAC in passing touchdowns. Williams is on a tear as well, he’s currently averaging 218 yards passing after three games. The key to this game will be the defensive performances of both teams. We all know that it will be an offensive shootout. The offense will start the clash and someone’s defense will have to end it. The last time we saw Florida A&M, the ending was embarrassing. Time management was not in the Rattlers favor as they lost to Jackson State at home, running run plays as time ran off the clock. This week, they face Savannah State. Just like Howard, SSU did not play last week. The Tigers will be in party crashers mode all season as this is their last season in the MEAC. And with the tape they have from FAMU’s last performance, they will have a solid game plan. FAMU quarterback Ryan Stanley will be consistent as usual, but coach Willie Simmons will most definitely be feeling the heat this week from the home crowd. SSU had two money games to start the season and has been rather fresh after sitting at home for a week. Although FAMU can blow them out the water, their last performance did not convince me of their true potential. In my upset of the week, give me Savannah State over FAMU….at FAMU. Norfolk State has literally played only five quarters this season. It soundly beat Virginia State in their first game. Then faced James Madison for only one quarter due to heavy rains and lightning. Its clash with Liberty was postponed due to Hurricane Florence. And now, NSU travels to SCSU to face the Bulldogs. SCSU’s meeting with NCCU was also postponed as well. All of that to say, well be getting some healthy play from both sides. 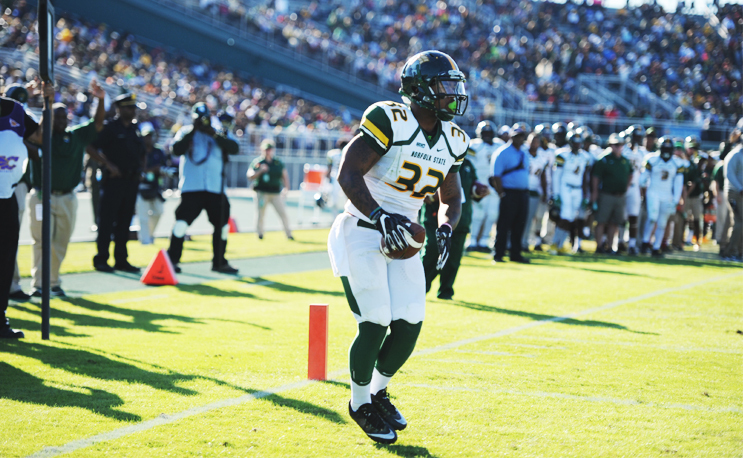 Aaron Savage, running back for NSU will be looking to have a good game on the ground. This situation will bring up some good discussion. This contest is considered a non-conference matchup. This is due to the MEAC having one less team. If you check the MEAC schedules, there are a few schools filling MEAC teams for dates that are not considered a conference game within their MEAC records. This will be a very interesting issue to watch as SSU leaves the conference after this year. A&T is 3-0, ranked 4th in the FCS polls, unbeaten for 15 games; and just that program. Lamar Raynard will have a cool game against the Bears. But don’t fully count out the Bears, their defense is nothing to underestimate. And MSU is coming off its best offensive performance in recent memory. Week Four and we still cashing checks out here. Gotta respect the hustle. NC Central will travel to Duke on their homecoming. The Bull City Gridiron Classic will be packed. Gives good exposure for NCCU.